13th October 2013- At approximately 09.45a.m. while the Sunday worship service was in progress, 2 Buddhist monks together with another youth from the village forcibly entered the premises where the worship service was being held. 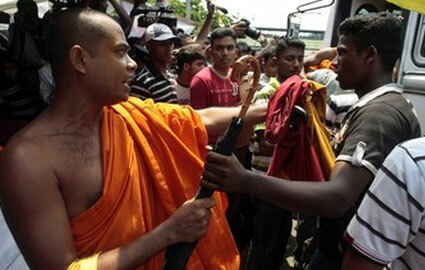 The Buddhist monks together with the youth shouted “Christianity is a western religion, stop all prayer meetings”. The Buddhist monk threatened the pastor and the congregation of serious consequences which they will face in the event the worship service activities are not stopped with immediate effect. 14th October 2013- A police officer visited the pastor’s premises and informed him to meet the Officer in Charge (OIC) of the area police station. The OIC informed the pastor that a police complaint has been lodged against him claiming that Buddhist statues have been desecrated by him in the village. The pastor denied the false accusations which were lodged against him and explained that he has not done any act of that nature. The OIC informed the pastor that an investigation will be conducted looking into the complaint filed and instructed the pastor to stop all worship service activities. However, the pastor explained to the OIC his Fundamental Rights to practice and observe his belief. 11th October 2013 A complaint against the pastor was made by a neighboring villager to the Municipal Council stating that an unauthorized church had been founded in the village. The mayor informed the pastor that he would be visiting his premises and to ensure that the church is closed down. 6th October 2013- At approximately 10:45pm, once the pastor and his family had fallen asleep, an unidentified group of persons began to pelt stones at the pastors’ residence. Some of the stones caused damage to the glass windows of the premises. A police complaint was lodged, holding complaint number 61/88/CID 2. 4th November 2013- At approximately 10:45pm, a group of unidentified persons began to attack the pastors’ premises by pelting stones at his house. The attack continued until 11.30pm, the police officers were informed, upon their arrival the attack ceased. The pastor was informed to lodge a police complaint. Once the police officers left the premises, around 1:15am, the attackers once again began to pelt stones at the premises which continued until 1.30am. A police complaint was lodged, holding number CID 1-149/71. The pastor has an ongoing case filed in the Magistrate Courts claiming his church as an unauthorized place of worship. Fearing further attacks, the pastor is holding prayer meetings in various different locations. A congregation of 127 members attend the church. 12th October 2013- A meeting was organized by the village Buddhist monks together with the villagers of Sevanagala. The Christian member was informed to be present at the Buddhist temple in the village. Upon the pastors arrival, around 20 villagers together with the Buddhist monks who were gathered together began to use derogatory language against the Christian member. The villagers shouted “Don’t bring Christianity to this village” and “This is a Buddhist village; you have no right to be here; you don’t belong here”. The Christian member left the meeting stating his right to belief, explaining that he has caused no harm to the village. At approximately 2 a.m., the Christian member and his family were awakened by a fire; their tractor had been set on fire by an unidentified group of persons. This tractor being the only source of the members livelihood, they attempted in vain to save the vehicle. However, it was completely damaged by the fire. The police authorities were immediately informed of this incident. Whilst inspecting the premises, the police officers found a petrol can and traces of petrol within the premises. They further noted that an attempt had also been made to burn down the house with the Christian family inside. A police complaint was lodged following which the police officers warned the villagers and spoke against this offence. However, no arrests have been made to date with regard to this offence. 30th September 2013- At approximately 10 a.m., a mob led by 15 Buddhist monks and 15 other villagers forcibly entered a Christian members premises. The mob began shouting threats stating “We will demolish this house if you don’t stop conducting prayer meetings”. The mob gave an ultimatum to the Christian member to stop prayer meetings conducted in the premises within 3 days, declaring that they would destroy the premises if the prayer meetings continued. 1st October 2013- By phone, police requested the Christian member to be present at the police station for an inquiry at 9.30 a.m. However, shortly after the call, a police vehicle arrived at the Christian’s premises and without prior notice instructed her to come with them to the police station. At the police station, 7 Buddhist monks together with some other villagers were also gathered. The police officer instructed her to stop all prayer meetings conducted at her premises. The police officer further threatened her of arrest under the Emergency Regulations in the event more than 5 people gather at her premises. The Emergency Regulations were only in force in Sri Lanka during the time of the ethnic war and it was used against possible terrorist suspects. The police officer together with the Buddhist monks forced the Christian to sign a document which stated that she will discontinue all prayer meetings held in her premises with immediate effect. By VOICE OF THE PERSECUTED in Asia, Christian Persecution News, Sri Lanka on November 19, 2013 .